Shortly after I got out of high school in 1972, I was living in Southern California and working a full-time summer job weighing and packing explosives into small detonators at a small company called Diamond Engineering in Castaic. I knew it wasn’t a job I would keep once I started community college in the fall, but the pay was decent. When a neighbor down the street offered to sell me his old surfboard, I figured I could afford the $50. Never mind that I lived an hour away from Rincon, the closest surfing beach or that the only experience I had was body surfing with friends on trips to the beach. Boogie Boards were just beginning to make an appearance so I didn’t even have that to fall back on. Nevertheless I figured that I could teach myself and besides it was probably worth it just for the coolness factor alone. In the end I probably only got to Rincon a handful of times and the self-education only got me to the point where I could actually ride a wave upright rarely and infrequently. I sold the Hobie to another friend that same fall after I started classes. I have always loved being in or on the water and have owned canoes, kayaks, sailing and rowing boats and of course any number of Boogie Boards. A few years ago I began to take notice of a new water craft that was showing up on the beaches called a stand up paddle board, or SUP for short. I know the idea of using a paddle while standing up on a boat or board has been around for a long time, but this new SUP was being marketed to the masses as a different kind of recreational activity. It was measured and thoughtful, almost zen-like. Photos and videos of folks peacefully engaged exploring harbors, coves and lakes aboard their SUPs rekindled some of that old coolness factor that I had associated with my surfboard. When research started showing that paddling a SUP also served to strengthen your core muscles, I was hooked. I had to have one. But unlike my spur-of-the-moment decision to purchase my surfboard 40 years earlier, this time I decided to do some research. About the boards anyway, I still figured I could teach myself to ride. Having experience building several watercraft, with my husband (and sometimes with our kids) we decided that it would make a good winter basement project. I knew at my age I had no interest in racing or long treks, just a board I could paddle around the lake and watch the loons and other wildlife without disturbing them. I learned that a wide board with a wide tail would be more stable and meet my needs. Because I am taller and heavier than most women paddlers, an 11 foot board would be a good fit. So in the winter of 2014 with a kit we purchased from Chesapeake Light we set to work. 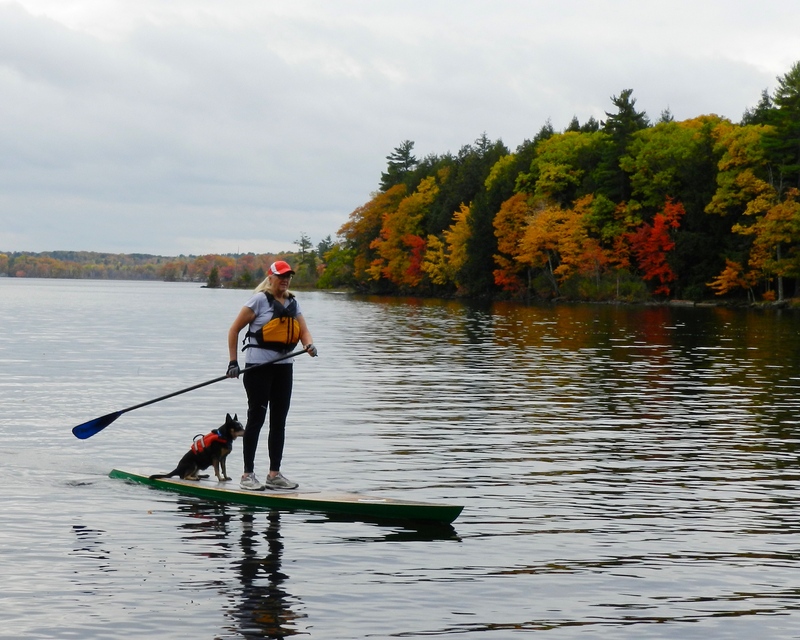 With my husband guiding me through the more technical aspects and a build interrupted by our annual “mud season” trip, my SUP was ready to launch on our lakefront when summer arrived. Online videos and instructions were helpful in getting me standing and moving forward and then practice, practice, practice. I still struggle a bit with the “tippy” feel I sometimes get in wind and waves or when a PWC or powerboat creates a wake, but I am feeling more confident every day. It didn’t take long for my Australian cattle dog to decide that she wanted to go along. So with her little doggie life-jacket buckled securely, she happily jumps on the board as soon as I place the SUP in the water and off we go. This entry was tagged Chesapeake Light, coolness factor, stand up paddle board, SUP, surfing, water sports, zen-like. Bookmark the permalink. « Focus on Firewood …when is enough more than you need?